I'm not sure that this merits a post, but just to let you know I'm still here, and still, albeit slowly, tatting. Here are the previous patterns joined to make a square. I did as usual make a mistake...my excuse was that I waiting to be interrogated by the gendarmes after a weekend on night duty...but I'm certainly not going to start again! 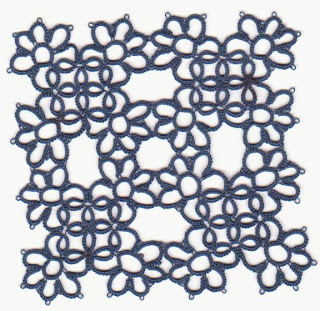 It is okay to make a mistake in your tatting, that is what makes each piece unique. This one is very pretty! It's very pretty. And -- to be honest, I can't see any mistake. Of course, I haven't gone over it with a magnifying glass either, and neither will anyone else! Very pretty and I don't see a mistake. Welcome back! I don't see a mistake either! All I see is a beautiful square! It's good to hear from you again! Thanks! You are such encouraging friends, it helps so much to have these encouraging remarks, and that's why I post my stuff, that and the pleasure of looking at yours...even if I don't always say anything. Wickedtats, the pattern is from Mary Konior's book...which I totally recommend, but if for any reason you can't get it, e-mail me at snowydavid at gmail.com and we'll try to sort it, OK? What mistake? I don't see it, so it's not a glaring mistake and I even went back and counted picots. I think you're too hard on yourself. A friend of mine was in the business of importing hand made oriental rugs and they laid them out and searched for small mistakes, as it was the one guarantee that it was hand made, and therefore MORE valuable. Just think of it as adding value to your tatting. I recognize that square from Mary Koniors book. You did a great job. What mistake? Well, curiously I had to search even though I knew what I was looking for. I began to wonder if it was a magic scanner that repairs errors! It's an extra picot in the centre of a flower bottom row second from left, OK? Snowy, You're so cute. Actually when I asked "What Mistake?" It was a hypothetical question + a compliment all rolled up in one phrase. It's also my way of saying (like Clyde said) that it's okay to make mistakes in tatting, we all do them and you can't even tell. THAT IS REALLY PRETTY!! GOOD JOB! !